Our patio furniture category is chock full of the best in patio seating. We have detailed reviews and informative articles and posts. These are items and information you won’t find in other places. This where you’ll find all the reviews for sectional sofas and modular furniture for poolside as well as outdoor living. The best furniture sets can be moved as needed to fit the unique square footage and design of your space. Most sets can be moved around without it looking like you’ve broken the furniture set apart. They blend together seamlessly when you want them to as well. Along with the traditional outdoor patio furniture you’d find in the backyard, we have found some of the most unique pieces for you. Have you ever seen a swing bed? They’re beautiful swings that just beg for people to nap on the back porch. Imagine yourself under the breeze of an island fan being lazy on vacation. Now, imagine that you don’t have to wait until your next vacation to enjoy that kind of lazy relaxation. Swing beds allow you to relax, read a book, have a nap, and watch your children playing outside. 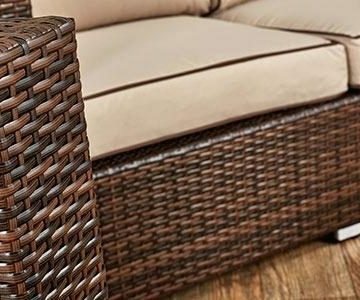 In our brand spotlight, we break down some of the best and well-known names in the patio furniture world. We’ll give you our opinion about what makes them great as well as where they might fall short. Do you know the difference between rattan and wicker? Many people use the terms interchangeably when they’re not the same at all. 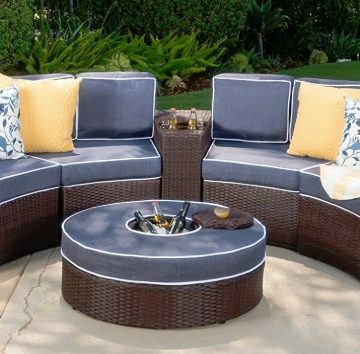 Browse our patio furniture category to find all the outdoor goodness you can handle.